The United States Congress designated the Winegar Hole Wilderness (map) in 1984 and it now has a total of 10,663 acres. All of this wilderness is located in Wyoming and is managed by the Forest Service. The Winegar Hole Wilderness was designated specifically to provide high quality habitat for the grizzly bear. Part of the Greater Yellowstone Ecosystem, this Wilderness is located on the southern boundary of Yellowstone National Park in western Wyoming. 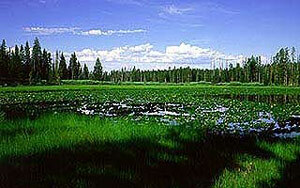 The low rolling hills with numerous wetlands, meadows and streams is volcanic in origin. A forest of lodgepole pine, Douglas fir, subalpine fir, and Engelmann spruce covers much of the area. The area is managed as a trailless area to provide maximum security for the grizzly bear except for one short trail that provides access to Yellowstone National Park. A permit is required to camp overnight and dogs are not allowed in Yellowstone National Park. Planning to Visit the Winegar Hole Wilderness? How to follow the seven standard Leave No Trace principles differs in different parts of the country (desert vs. Rocky Mountains). Click on any of the principles listed below to learn more about how they apply in the Winegar Hole Wilderness.